The team at Artsreach are incredibly pleased to announce that the Dorset based touring arts charity has been successful in their bid to the Arts Council Catalyst: Small grants programme, designed to support organisations to invest in systems, or training and development for staff, volunteers and boards, or to cover the costs of external expertise to increase fundraising. 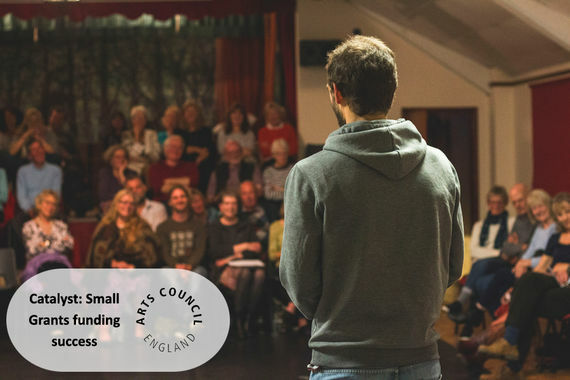 Artsreach is dedicated to providing people in rural Dorset with access to professional live performances and creative arts projects in rural venues and communities at affordable and accessible prices. Its performance programme runs through a network of around 50 volunteer promoting groups and together the scheme coordinates over 140 high quality professional events every year, usually in village halls, right across rural Dorset. Phil Gibby, Area Director, South West, Arts Council England, said: "We’re delighted to support Artsreach through our National Lottery funded Catalyst Small Grants programme, this investment will help to build their fundraising capacity and attract more private giving." "The Catalyst Small Grants fund is one of the measures we put in place to help create a more sustainable and resilient arts and culture sector. This grant is one of more than one hundred we are making across England and we look forward to seeing the impact this investment will have for Artsreach and more widely across the country." Arts Council England will be investing over £2million in 117 small to medium sized organisations across the Country. Find out more about the grant awards.